The majority of oxygen in the body is transported by hemoglobin, which is found inside red blood cells. Hemoglobin is made up of four subunits and can bind up to four oxygen molecules. Carbon dioxide levels, blood pH, body temperature, environmental factors, and diseases can all affect oxygen’s carrying capacity and delivery. A decrease in the oxygen-carrying ability of hemoglobin is observed with an increase in carbon dioxide and temperature, as well as a decrease in pH within the body. Sickle cell anemia and thalassemia are two hereditary diseases that decrease the blood’s oxygen-carrying capacity. Although oxygen dissolves in blood, only a small amount of oxygen is transported this way. Only 1.5 percent of oxygen in the blood is dissolved directly into the blood itself. Most oxygen, 98.5 percent, is bound to a protein called hemoglobin and carried to the tissues. Hemoglobin, or Hb, is a protein molecule found in red blood cells (erythrocytes) made of four subunits: two alpha subunits and two beta subunits. Each subunit surrounds a central heme group that contains iron and binds one oxygen molecule, allowing each hemoglobin molecule to bind four oxygen molecules. Molecules with more oxygen bound to the heme groups are brighter red. As a result, oxygenated arterial blood where the Hb is carrying four oxygen molecules is bright red, while venous blood that is deoxygenated is darker red. Hemoglobin: The protein inside red blood cells (a) that carries oxygen to cells and carbon dioxide to the lungs is hemoglobin (b). Hemoglobin is made up of four symmetrical subunits and four heme groups. Iron associated with the heme binds oxygen. It is the iron in hemoglobin that gives blood its red color. It is easier to bind a second and third oxygen molecule to Hb than the first molecule. This is because the hemoglobin molecule changes its shape, or conformation, as oxygen binds. The fourth oxygen is then more difficult to bind. The binding of oxygen to hemoglobin can be plotted as a function of the partial pressure of oxygen in the blood (x-axis) versus the relative Hb-oxygen saturation (y-axis). The resulting graph, an oxygen dissociation curve, is sigmoidal, or S-shaped. As the partial pressure of oxygen increases, the hemoglobin becomes increasingly saturated with oxygen. 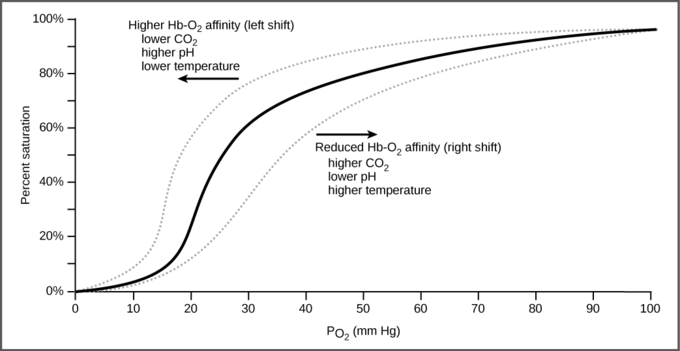 Oxygen dissociation curve: The oxygen dissociation curve demonstrates that as the partial pressure of oxygen increases, more oxygen binds hemoglobin. However, the affinity of hemoglobin for oxygen may shift to the left or the right depending on environmental conditions. The oxygen-carrying capacity of hemoglobin determines how much oxygen is carried in the blood. In addition, other environmental factors and diseases can also affect oxygen-carrying capacity and delivery; the same is true for carbon dioxide levels, blood pH, and body temperature. When carbon dioxide is in the blood, it reacts with water to form bicarbonate (HCO3−) and hydrogen ions (H+). As the level of carbon dioxide in the blood increases, more H+ is produced and the pH decreases. The increase in carbon dioxide and subsequent decrease in pH reduce the affinity of hemoglobin for oxygen. The oxygen dissociates from the Hb molecule, shifting the oxygen dissociation curve to the right. Therefore, more oxygen is needed to reach the same hemoglobin saturation level as when the pH was higher. A similar shift in the curve also results from an increase in body temperature. Increased temperature, such as from increased activity of skeletal muscle, causes the affinity of hemoglobin for oxygen to be reduced. Diseases such as sickle cell anemia and thalassemia decrease the blood’s ability to deliver oxygen to tissues and its oxygen-carrying capacity. In sickle cell anemia, the shape of the red blood cell is crescent-shaped, elongated, and stiffened, reducing its ability to deliver oxygen. In this form, red blood cells cannot pass through the capillaries. This is painful when it occurs. Thalassemia is a rare genetic disease caused by a defect in either the alpha or the beta subunit of Hb. Patients with thalassemia produce a high number of red blood cells, but these cells have lower-than-normal levels of hemoglobin. Therefore, the oxygen-carrying capacity is diminished. 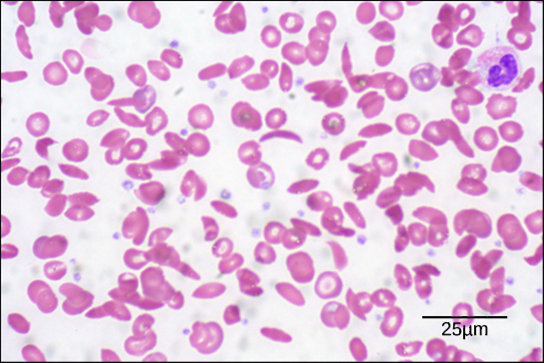 Sickle cell anemia: Individuals with sickle cell anemia have crescent-shaped red blood cells. Diseases such as this one cause a decreased ability in oxygen delivery throughout the body. Dissolution, hemoglobin binding, and the bicarbonate buffer system are ways in which carbon dioxide is transported throughout the body. Carbon dioxide is more soluble in blood than is oxygen; about 5 to 7 percent of all carbon dioxide is dissolved in the plasma. Carbon dioxide has the ability to attach to hemoglobin molecules; it will be removed from the body once they become dissociated from one another. In the bicarbonate buffer system, the most common form of carbon dioxide transportation in the blood, carbon dioxide is finally expelled from the body through the lungs during exhalation. Importantly, the bicarbonate buffer system allows little change to the pH of the body system; it allows for people to travel and live at high altitudes because the system can adjust itself to regulate carbon dioxide while maintaining the correct pH in the body. Several properties of carbon dioxide in the blood affect its transport. First, carbon dioxide is more soluble in blood than is oxygen. About 5 to 7 percent of all carbon dioxide is dissolved in the plasma. Second, carbon dioxide can bind to plasma proteins or can enter red blood cells and bind to hemoglobin. This form transports about 10 percent of the carbon dioxide. When carbon dioxide binds to hemoglobin, a molecule called carbaminohemoglobin is formed. Binding of carbon dioxide to hemoglobin is reversible. Therefore, when it reaches the lungs, the carbon dioxide can freely dissociate from the hemoglobin and be expelled from the body. Third, the majority of carbon dioxide molecules (85 percent) are carried as part of the bicarbonate buffer system. In this system, carbon dioxide diffuses into the red blood cells. Carbonic anhydrase (CA) within the red blood cells quickly converts the carbon dioxide into carbonic acid (H2CO3). Carbonic acid is an unstable, intermediate molecule that immediately dissociates into bicarbonate ions (HCO3−) and hydrogen (H+) ions. Since carbon dioxide is quickly converted into bicarbonate ions, this reaction allows for the continued uptake of carbon dioxide into the blood, down its concentration gradient. It also results in the production of H+ ions. If too much H+ is produced, it can alter blood pH. However, hemoglobin binds to the free H+ ions, limiting shifts in pH. The newly-synthesized bicarbonate ion is transported out of the red blood cell into the liquid component of the blood in exchange for a chloride ion (Cl-); this is called the chloride shift. When the blood reaches the lungs, the bicarbonate ion is transported back into the red blood cell in exchange for the chloride ion. The H+ ion dissociates from the hemoglobin and binds to the bicarbonate ion. This produces the carbonic acid intermediate, which is converted back into carbon dioxide through the enzymatic action of CA. The carbon dioxide produced is expelled through the lungs during exhalation. The benefit of the bicarbonate buffer system is that carbon dioxide is “soaked up” into the blood with little change to the pH of the system. This is important because it takes only a small change in the overall pH of the body for severe injury or death to result. The presence of this bicarbonate buffer system also allows for people to travel and live at high altitudes. When the partial pressure of oxygen and carbon dioxide change at high altitudes, the bicarbonate buffer system adjusts to regulate carbon dioxide while maintaining the correct pH in the body. While carbon dioxide can readily associate and dissociate from hemoglobin, other molecules, such as carbon monoxide (CO), cannot. Carbon monoxide has a greater affinity for hemoglobin than does oxygen. Therefore, when carbon monoxide is present, it binds to hemoglobin preferentially over oxygen. As a result, oxygen cannot bind to hemoglobin, so very little oxygen is transported throughout the body. Carbon monoxide is a colorless, odorless gas which is difficult to detect. It is produced by gas-powered vehicles and tools. Carbon monoxide can cause headaches, confusion, and nausea; long-term exposure can cause brain damage or death. Administering 100 percent (pure) oxygen is the usual treatment for carbon monoxide poisoning as it speeds up the separation of carbon monoxide from hemoglobin. 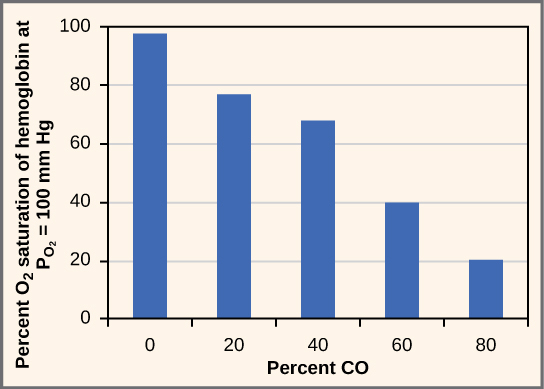 Carbon monoxide poisoning: When carbon monoxide (CO) in the body increases, the oxygen saturation of hemoglobin decreases since hemoglobin will bind more readily to CO than to oxygen. Therefore, CO exposure leads to death due to a decreased transportation of oxygen in the body.